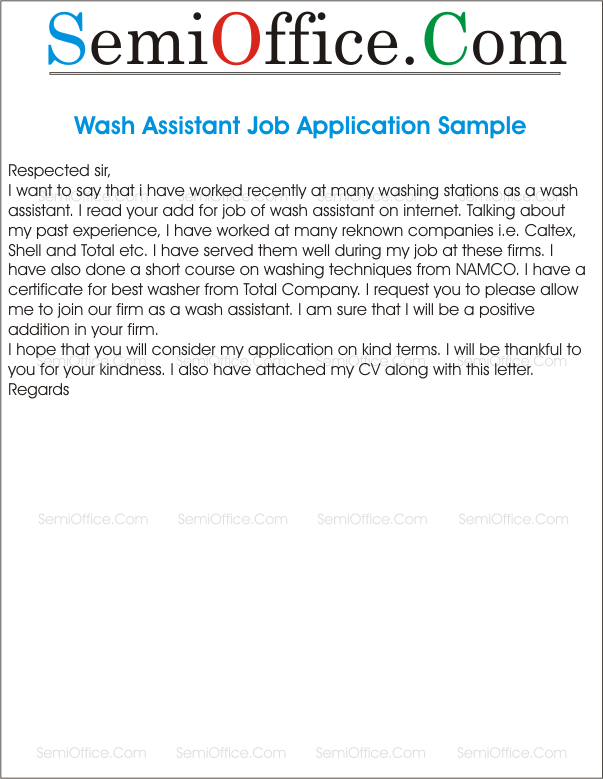 Sample job application for washer, car wash, factory washer, clean/carpet washer, floor washing etc. I want to say that I have worked recently at many washing stations as a wash assistant. 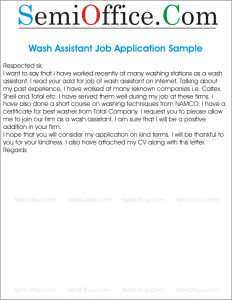 I read your add for job of wash assistant on internet. Talking about my past experience, I have worked at many renowned companies i.e. Caltex, Shell and Total etc. I have served them well during my job at these firms. I have also done a short course on washing techniques from NAMCO. I have a certificate for best washer from Total Company. I request you to please allow me to join our firm as a wash assistant. I am sure that I will be a positive addition in your firm. I hope that you will consider my application on kind terms. I will be thankful to you for your kindness. I also have attached my CV along with this letter. I have been informed by reliable resources that a post of wash assistant is vacant here. I find myself a suitable candidate for this job. I fulfill all the requirements mentioned in your add. I hold a high school degree and a one year diploma in laundry management from City College. I have previously worked for Bay Watch Laundry for one year as a wash assistant. I desperately need this job as I am jobless these days and I have no source of income to cover my expenses. My resume and relevant experience letters are attached with this application. I hope that I will be considered for this job.